I took this picture over the weekend at the supermarket. It was in the drug aisle — a popular spot for shoplifters (that’s not why I was there). Now here’s the thing. 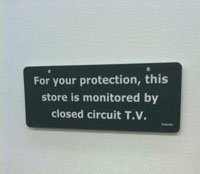 As a customer, I have no problem with the supermarket installing a camera and no objection to their telling me about it. The mistake, however, is posting a sign with a plausible-sounding reason, instead of just telling the truth. After all, what exactly are these cameras protecting me from… a riot in the produce section? Your clients and customers aren’t stupid. It’s a lot simpler — and loads better for your reputation — to just level with them.